The first day of June threatened rain upon Orange County with gloomy clouds and no breakthrough of sunshine. 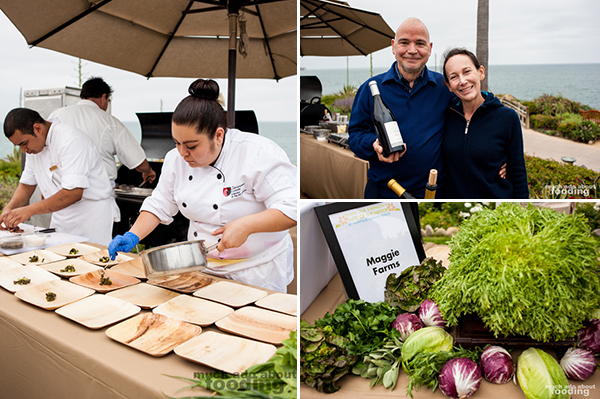 Luckily, no drops were shed from the sky on Laguna Beach, CA on June 2nd where Share Our Strength hosted Taste of the Nation®, its premier culinary benefit. 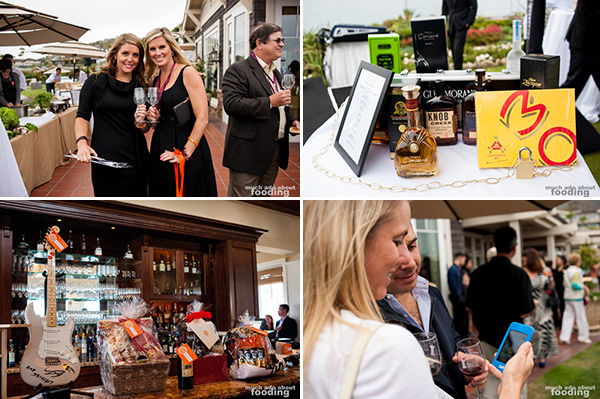 Held at the breathtaking Montage Laguna Beach from 4pm to 7pm (with a VIP reception until 9pm), the Taste of the Nation 2013 was a highly anticipated event for the food lovers and elite of Orange County whose participation raised funds toward fighting childhood hunger. 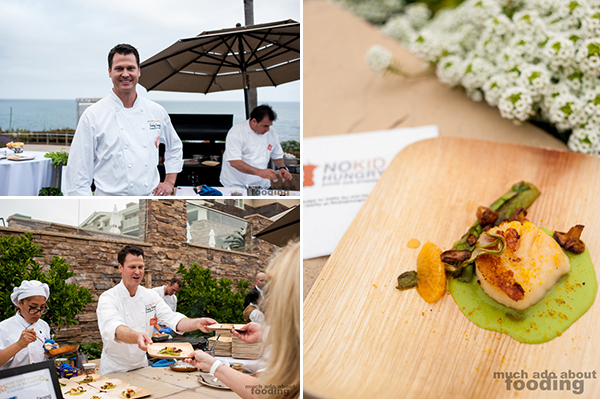 Revered chefs gathered to give the hundreds of guests a taste of their finest offerings; guests gathered to support the No Kid Hungry campaign and raised more than $203,000 for community programs such as the Orange County Food Bank and Second Harvest Orange County Food Bank. 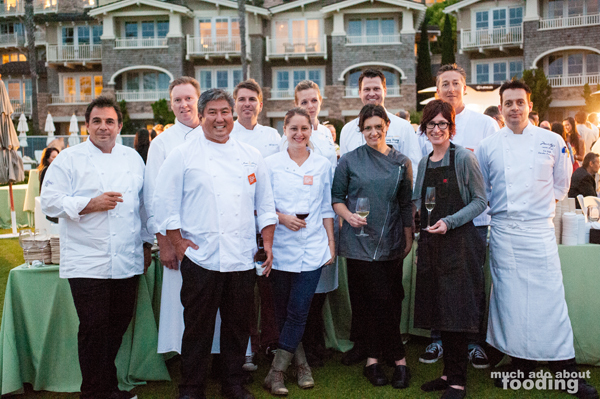 In addition to the cast of star chefs present at Taste of the Nation 2013 in Laguna Beach, the team of organizers consisting of Judy Walker, Teresa Siriani, Justin Schuvie, Caroline Stoll, Avery Block, Gina Mims, Pamela Waitt, Todd Orlich and others ensured that the event was a success. Due to various sponsorships and the team's efforts, 100% of ticket sales were publicized to be donated to charity. 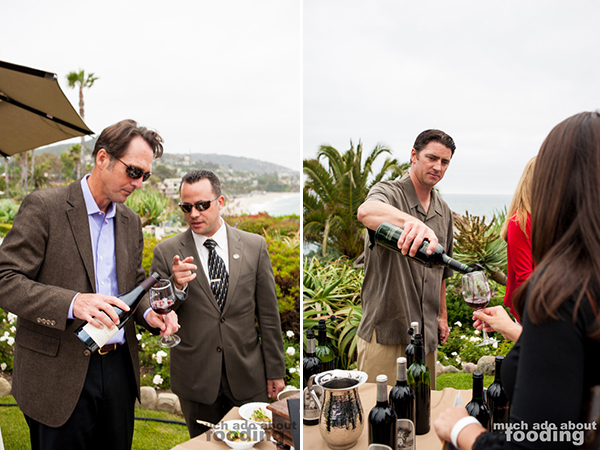 The national presenting sponsor was Sysco; national sponsors were American Express, ONEHOPE Wine, Emmi Roth USA, Cavit Collection Wines, OpenTable, and The Food Network; and local sponsors were S. Pellegrino, Lexus, Montage Laguna Beach, Celebrity Cruises, Epstein Becker Green, Evans Family Foundation, ICG, Southern California Gas Company, and Orange Coast Magazine, some of whom were present at the event itself, especially the beverage sponsors such as Haven Gastropub + Brewery, Snake Oil Cocktail Company, and Acqua Panna. One hundred percent of ticket sales support Share Our Strength’s efforts to end childhood hunger.For those of you unfamiliar with Taste of the Nation, it is a country-wide series of exquisite tasting events with celebrity chefs that began in 1988 and continue to this day, adding to their impressive collection of more than $82.5 million raised toward ending childhood hunger..
Every chef present that evening was paired with a farm and winery wherever they were set up. 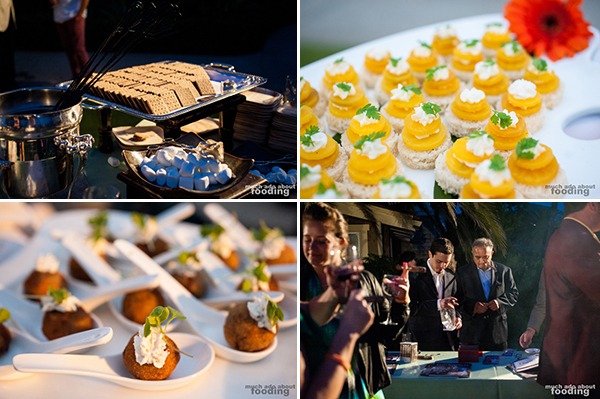 Cooking live with assistants and plating beautiful concoctions, the serving areas were entertainment in themselves. 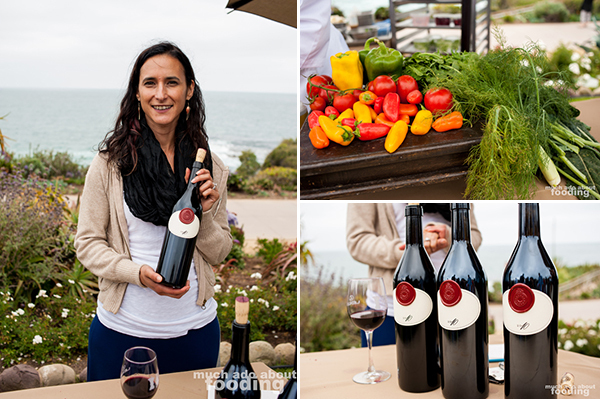 Hosting Chef Craig Strong, Executive Chef of Studio at Montage Laguna Beach (Laguna Beach, CA), served Seared Scallops (with asparagus, tangerines, Chanterelles, and a tango gastrique) and was next to VR Green Farms and ZD Wines. This was certainly one of our favorites as the thick scallops' clean taste was highlighted by citrus notes; also, how do we deny the tasty savoriness of mini Chanterelles? 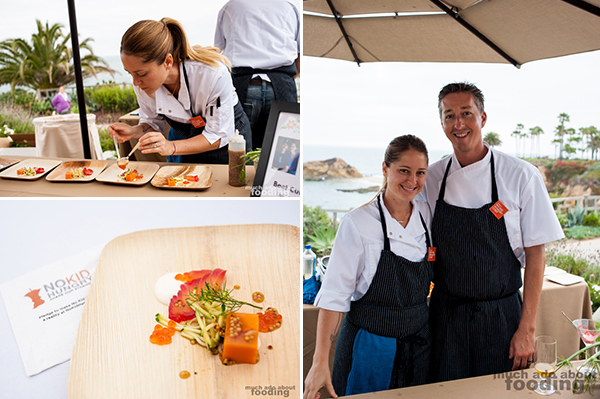 Chefs Nick Roberts & Brooke Williamson from Hudson House/The Tripel (Los Angeles, CA) and Top Chef Season 10 served Beet Cured Salmon (with heirloom tomato gelee, zucchini salad, Thai chili cream, and salmon roe) alongside Tutti Frutti Farms and Sonoma-Cutrer Vineyards. Not only was the presentation beautiful but the independent elements as refreshing by themselves as when all together, especially the gelee. 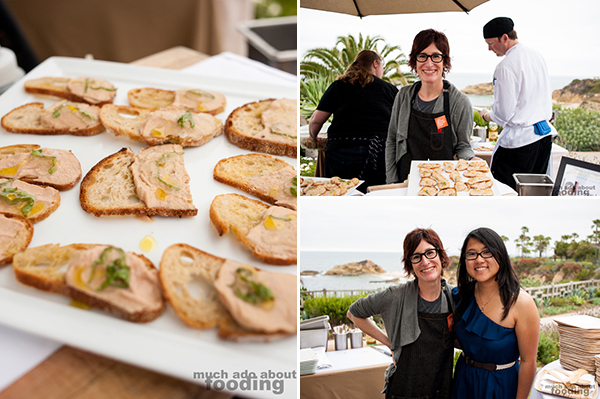 Chef Jenn Louis of Lincoln/Sunshine Tavern (Portland, OR) and a Food & Wine Best New Chef 2012 served a Bruschetta of chicken liver mousse and herb gelee next to Maggie Farms and Silver Oak Cellers. I absolutely adored the liver mousse and the crisps it came on top of. 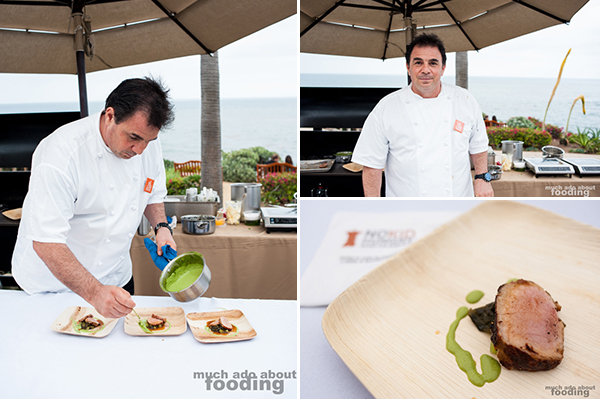 Chef Josiah Citrin of two-Michelin star Mélisse (Los Angeles, CA) served Veal Loin (with celtuce, sea vegetables, and sorrel) alongside Coleman Farms and Soliste Winery. The greens were a good match with the juicy slices of veal every plate had. 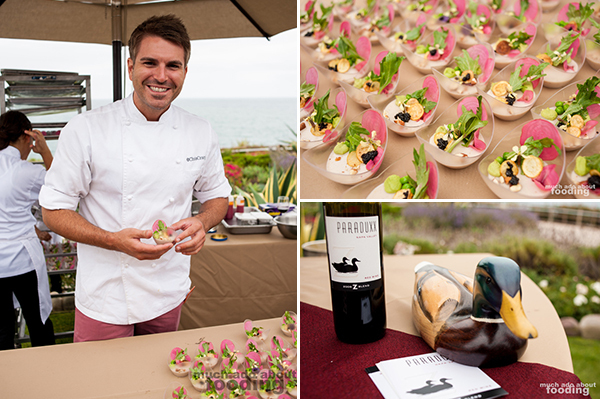 Chef Chris Crary (Santa Monica, CA) from Top Chef Season 9 presented translucent boats of Uni & Almond Panna Cotta (with caviar, peas, pickled beets, and crispy potatoes) next to Weiser Farms and Paraduxx Winery. These gorgeous and appropriately spring-colored treats were creative, light, and nearly playful with the mixture of textures as one spooned it up. 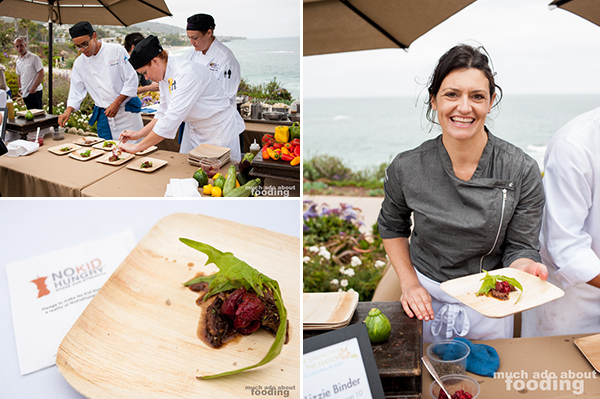 There was also Chef Lizzie Binder from Top Chef Season 10 and formally with Bar Bambino (San Francisco, CA) plated morsels of Braised Duck (with roasted strawberry and dandelion greens) next to Gloria Farms and Buccella Wines. 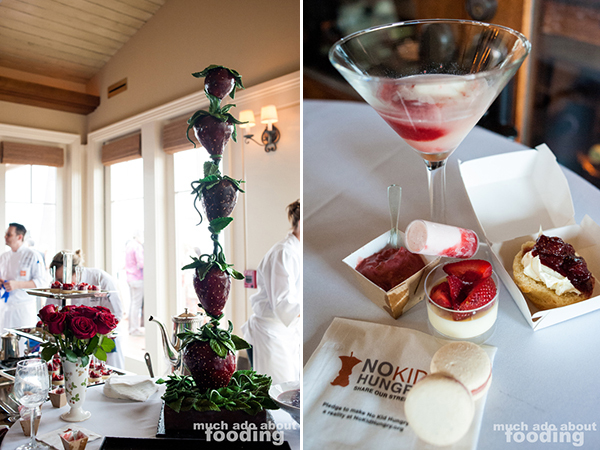 The roasted strawberry nearly melted with the softness of the duck. Chef Alan Wong of Alan Wong’s Restaurant (Honolulu, HI) had a large set-up with Steamed Opakapaka (pork hash and ginger) by him and spicy shooters from Polito Farms (Alysian Wines were pouring aplenty next-table). The steamed fish had a wonderful aroma and tasted even better with the gingery spiciness. While all of the chefs had their stations outside, inside was the playroom of Chef Lee Smith, Executive Pastry Chef of Studio at Montage Laguna Beach (Laguna Beach, CA), who gave the sweets lovers a run for their money. Strawberry versatility was shown via Strawberry Risotto (white chocolate & citrus olive oil), Strawberry Black Pepper Macarons, Strawbery Pot de Creme, a Sgroppino drink (local organic lemon sorbet, strawberries, and prosecco), Frozen Strawberry Creme Fraiche Push Up Pops, and English Scones (with Devonshire cream and jam). However you like your desserts, he had a style ready, and we were very pleased with the beauty of his macarons which contained a warm jam inside. How is that even feasible? No matter - it was perfect. 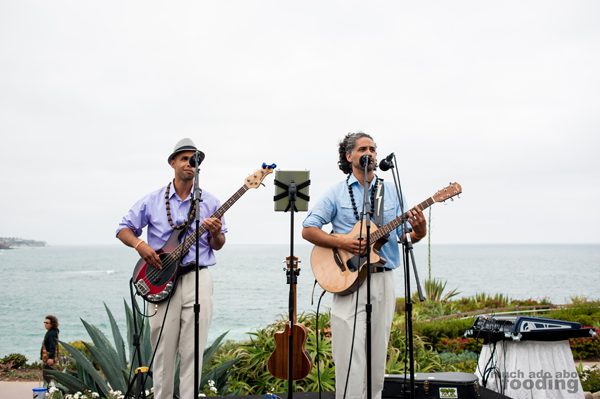 As guests mingled with each other, the wine was generously flowing into Taste of the Nation wine glasses and the Kalama Brothers wooed our ears with their covers and original songs. Silent auction items sat inside, presented with tags of their donors and item contents. I found the event's use of bidding technology fascinating as they were utilizing Bidpal, a mobile smartphone-like device that could be passed around from guest to guest for bids to be made. For fun, there were also two large prizes to win outside of wine and whisky whose winners were to be determined by the purchase of the correct key. It didn't take long for the winner of the whiskey and cigar selection to be determined. In an eruption of cheers, the winner collected the prize for his two friends quickly. 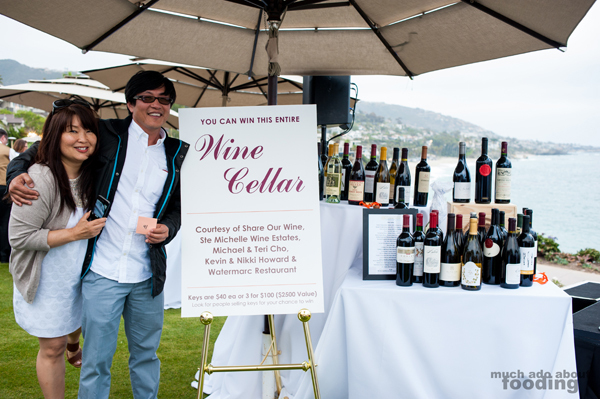 For the wine cellar prize, however, a key-lock malfunction turned the tables over to random draw through which Ed Lee of Wahoo's Tacos won the fine selection (congratulations Ed!). 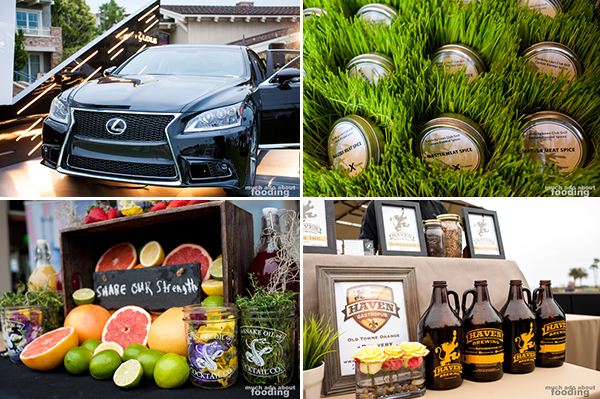 With a live auction in addition to the key prizes and silent auction items, Taste of the Nation managed to raise $57,000+ from bids that contributed to the overall total for the evening. Think of what can be done with that to help end childhood hunger. After such winnings, the evening was over for those who had come in on General Admission. The rest headed over to another section of the Montage for the VIP reception. 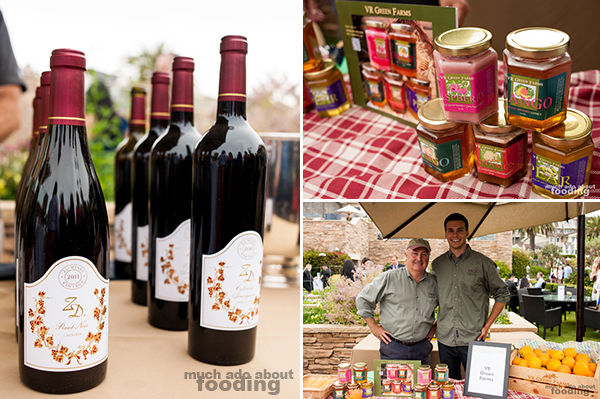 What foodie event would ever have a shortage of food? 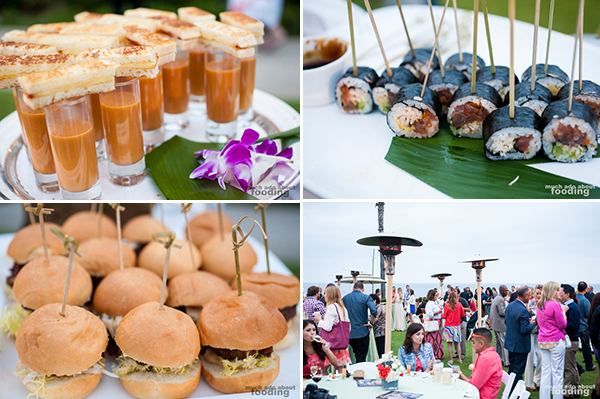 Finger foods such as tomato soup shooters with grilled cheese, ahi tuna rolls, and lamb sliders were tray-passed by the courteous wait staff of Montage. 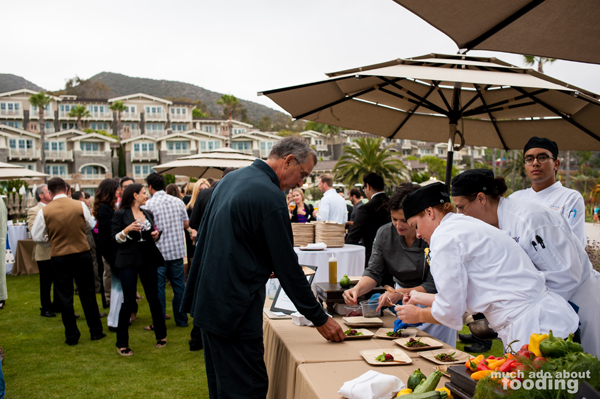 Guests enjoyed each other's company and meeting with the celebrity chefs in a casual, cocktail environment. A complimentary cigar lounge hung in the back corner of the space to allow for guests to share in smoking with one another, and bartending stations provided beers and house wines. If you are interested in attending next year's event, the anticipated date will be June 1, 2014. 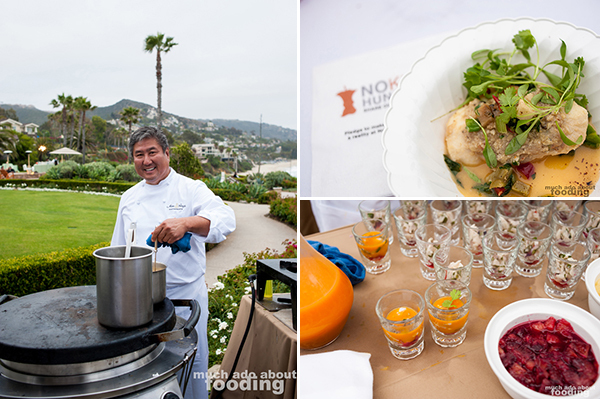 Tickets for this year's Taste of the Nation Montage Laguna Beach were $150 General Admission and $250 VIP. 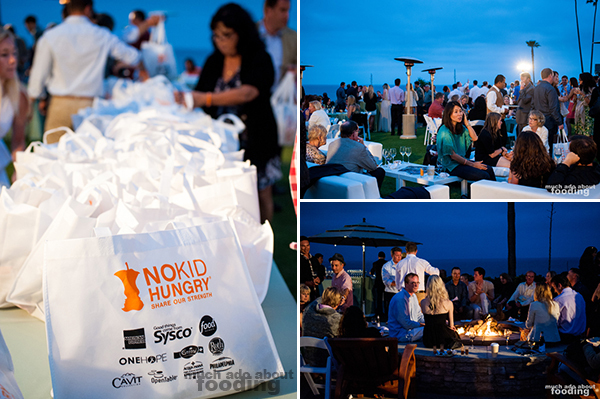 My hats off to the chefs and their staff for all of their hard work and donated time to this event. For most of them, this was not the first event they have done for Share Our Strength. It is that dedication to food and its power on people, hungry or not, that I think drives them to keep at their passionate craft. 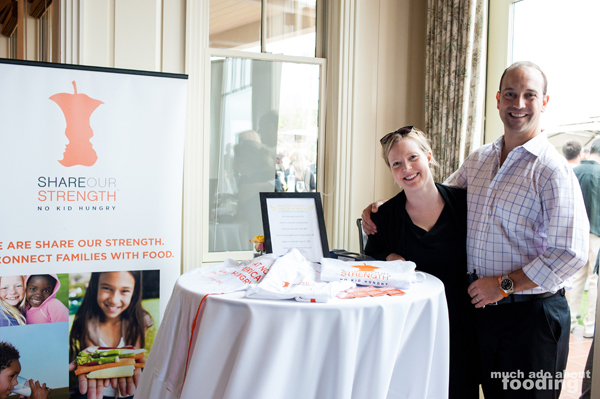 How inspiring to see so much support from the culinary community and from Orange County to ensuring that No Kid Hungry becomes a reality for all. If you are interested in this cause, you must visit them and show your support as well. I have been giving to Share Our Strength since December 2012 and don't plan on stopping any time soon (or ever?). Take the pledge today. Photography by Duc Duong. More photos (171 total) are available for viewing by clicking here and on Facebook. What a great night! Thanks for capturing it! I'm hungry now!